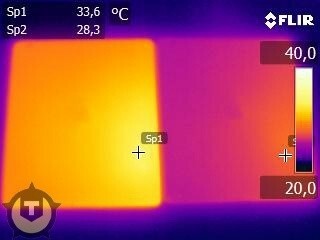 Thermal imaging has confirmed what many have been reporting since the launch of the new iPad on March 16 – Apple’s third generation tablet produces a good deal more heat than its predecessor. A thermal camera pointed at the back of each slate shows the new iPad runs 9.6 Fahrenheit (5.3 Celsius) warmer than last year’s model, according to the team at tweakers.net (Dutch). Reports of a warmer iPad started pouring in soon after the tablet went on sale last Friday. Specifically, the bottom left corner (when held in standard portrait mode) tends to warm up when the iPad is being put to good use. Some reports, like this one from the Atlantic Wire claim that the new iPad overheats and goes into an automatic cool-down mode. Granted, the users in question were all working under direct sunlight before the message appeared. The more common complaint seems to be just a warmer iPad in general – overheating claims appear to be rare. Indeed, our own in-house iPad does get noticeably warmer than the iPad 2 under heavy use. I first noticed this when restoring a backup of the iPad 2 from iCloud and updating all of my apps from the App Store. The symptoms continued as I worked on multiple photos in iPhoto as part of our upcoming review. In my opinion, the added heat is noticeable but it hasn’t been a problem for me. The effects would likely be amplified if using a fully enclosed case. Of course, I wouldn’t take my iPad to the beach on a hot sunny day either. It is believed that the new A5X SoC combined with the 70 percent larger battery is responsible for the extra warmth. Even under light use, the new iPad has to work harder to power the increased number of pixels found in the retina display. Have you experienced any overheating issues with your new iPad?